Refugee left on the streets by Newham Council + racist private landlords. Who can help Ibrahim now? When I first got to London I was put into home office accommodation called NASS which is based in Newham. I stayed there from September 2014 – April 2015 whilst the Home Office decided if they would give me refugee status. Once this status was granted, I was given 28 days to leave, open a bank account, find a home, etc. It took me a long time to open a bank account even though I had all the official documents and support from the Refugee Council. This meant I could not get any benefits, so I was alone without money, without a job, no national insurance number and no roof over my head. The Refugee Council gave me an official letter stating that I was completely homeless, and with this I went to Newham Council who told me to come back at 9 am the next day. I made sure I slept rough close by that night, so I was first in line at the housing office in the morning, and I started queuing at 7am. When they met me, they got me a translator and took down my story. They took my contact details, gave me a ‘Housing Options’ letter which listed 3 hostels, and said they would be in touch. I went to the hostels straight away, but they had no space for me, so I waited for the phone call from the council. After 2 weeks, I wondered why no one had rang me. 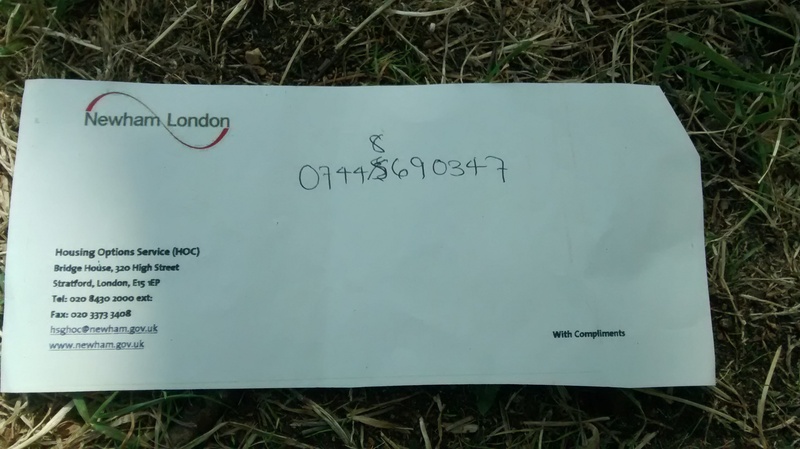 It turns out at the previous meeting, the council had written my phone number down wrong. No one apologised to me for this. They gave me another letter, but there was no translator present this time so I didn’t understand what it meant – my friend read it for me later and it said they acknowledged that I was street homeless, but that they would not offer me housing. They told me to look for private accommodation. My friend phoned one of the hostels up a few weeks ago on my behalf, and they said they had been trying to get in touch with me as a space had opened there, but because the council had not corrected the wrong phone number on their system, I never got the message. I was told by the hostel that if my friend hadn’t rang up that day I would be completely off their records. I try to look for private accommodation, but it is a struggle as deposits are very high and many landlords don’t take DSS. I got close to getting a room once but they heard my voice, and because I have trouble speaking English, they refused to go any further. To get private accommodation I have to save for a deposit, but it is hard to get a job when you are sleeping on the streets and have no address – people don’t employ you. I also have to get an English speaking friend who has a ‘good accent’ to phone landlords, as they don’t accept me when I phone. I have now been street homeless for 5 months, with no end in sight. I try and sleep during the day in a park near the Olympic stadium, and keep awake all night for safety. When it rains I sleep in the police station. I walk very far each day. I have to get to my college course and to work training courses. I have no income aside from money the Refugee Council can afford to give me from their petty cash – sometimes £10 a week, sometimes £20. I struggle as I have to top my phone up a lot to call landlords, so don’t eat much. I try to stay clean and well dressed to get a job, and wash in the local Mosque, which they allow as I am Muslim. 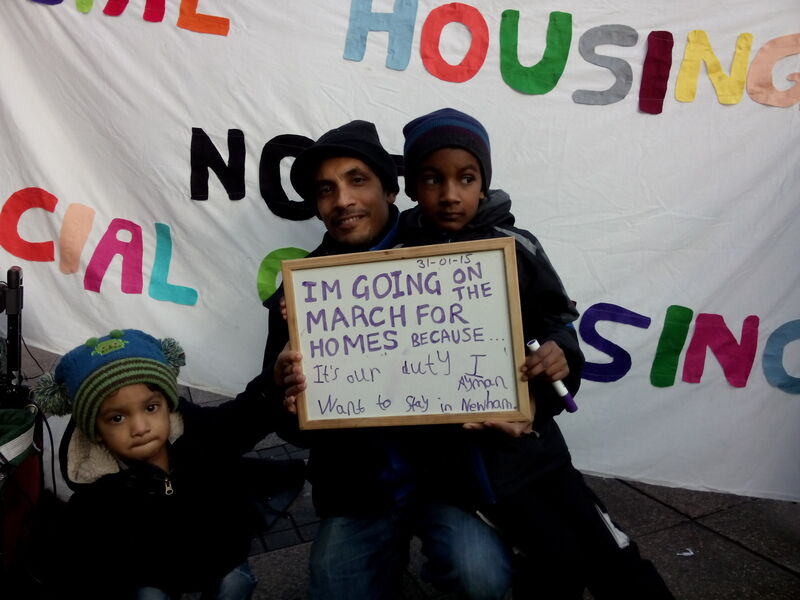 Focus E15 campaign stands with Ibrahim in his fight for housing. Many refugees face escalated difficulties and racism and get very little support from anyone. Currently Ibrahim sleeps on the streets near the Olympic Park whilst homes lie empty on the Carpenters Estate, and many other places around London. It is unacceptable for any Council to fail to support the most vulnerable in their borough, including refugees. Ibrahim’s words were translated for us by the Asylum Clinic, who we met with Ibrahim whilst they passed our stall, after getting basic supplies for their clinic to help Refugees.